Unless you live in a cave somewhere, with no way to connect to the outside world, you know the total solar eclipse will be here tomorrow. The countdown is picking up speed. If you are near the center of totality, you will have approximately two and a half minutes of total eclipse. The time becomes shorter the closer you are to the edge of the zone of totality. I have seen partial eclipses before, but never a total eclipse. This is the first one to span the entire USA in 99 years. The last total eclipse to span the entire US from Washington state to Florida was on June 8, 1918. The path of that one was similar, but not quite identical, to the one which will take place next Monday. Xavier Jubiear created one of the best interactive sites on the internet. Xavier’s eclipse site. Another good site is the Great American Eclipse, also interactive. If you don’t get to see the 2017 eclipse, there will be another total eclipse April 8, 2024. That is only six years from now. The 2024 eclipse will cross the US from Mexico up through Maine. After that, the eclipse of August 12, 2045 will start over northern California, passing across the southern states and Florida. That track will be similar to the one tomorrow, but a couple of hundred miles south of Monday’s track. Since that will be 28 years from now, if you are under fifty years old, there is a chance you may get to see that one, unless the human race blows ourselves up first. If you are extremely young and have good health, you may get to see the last US eclipse of the 21st Century on September 14, 2099. Here is a map showing all future eclipses of the 21st Century. Eye safety is paramount. Eyes cannot be replaced. It goes without saying, that you should never look at the sun during any portion of the eclipse, when even the tiniest portion of the sun is exposed, with an optical magnifying device. That includes cameras, binoculars and telescopes. During the period of totality, you will be able to look at it with the naked eye. Brightness of the corona ought to be about as bright as a full moon. Be ready to look away and put eye protection back on before the sun begins to reappear. If you do not have certified protective eclipse eye wear by now, you are out of luck. American Paper, in Bartlett, TN is one of the largest manufacturer of certified sun-filtering equipment. I am told by friends and relatives in Memphis that American Paper has been going full blast for some time, but not even they anticipated the demand. For those who were caught unprepared for this eclipse, you have six years to get ready for the next one, which will cross the US from south to north. Get eyewear, optical equipment and filters, and make arrangements for lodging or camping well in advance. And by well in advance, I mean five or six years, if possible. I have been told that even cheap hotel rooms along the path of totality are going for $1,000 per night, with a two day minimum. Campground reservations were booked solid a long time ago. For those who prefer to stay home and get a good view, NASA is livestreaming the eclipse from noon to 4 PM Eastern time. LIVESTREAM LINK. This time span includes the 1.5 hours of totality across the United State. Totality begins in Oregon at about 1:15 PM Eastern time, and ends as the track of totality moves out to see off the South Carolina coast at about 2:49 PM Eastern. Here is an article from Sky & Telescope which shows how to use binoculars on a tripod to produce a magnified image of the partial eclipse. 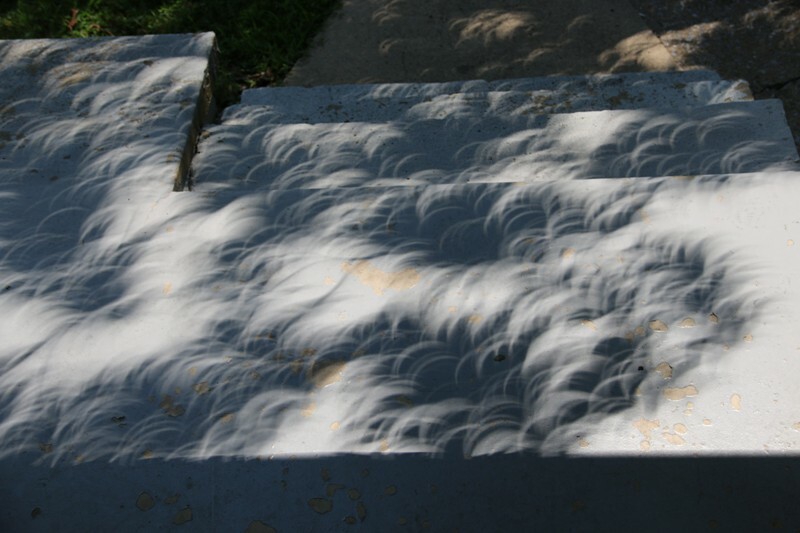 Here are some neat animations of moon’s shadow along the earth’s surface. WARNING: If eyewear was ordered by mail, be sure to check the mailing label. Counterfeit glasses have been sold on Amazon and other mail order vendors. The Memphis, TN school system ordered a large supply of eclipse eye glasses from Amazon. The glasses came, labeled with the name and address of American Paper Optics, located in Bartlett, Tennessee. Bartlett is a suburb of Memphis. The proper code numbers were printed on them, but the mail room people at the school noticed the shipping label said they came from China. Someone from the school took them over to American Paper Optics offices in Bartlett. APO quickly determined they were counterfeit. Good thing that was caught before the glasses were handed out to every kid in the school. Amazon was contacted, and they are taking immediate action to shut that vendor down. At this late date, that won’t help much if someone’s vision is damaged from counterfeits. NASA posted a list of approved eye protection equipment, as well as some instructions for viewing safely. These are not so much suggestions as warnings. NASA page on eye safety at this link. If you don’t have eclipse glasses now, you are probably out of luck for direct viewing. Every vendor within several hundred miles of the zone of totality is sold out. the following information is for checking whether your eclipse glasses may be fake or not. If you ordered online from any vendor other than the ones listed by the AOA, there is a good chance they are fakes. If you ordered directly from any of these vendors, you should be safe. For a list of American Astronomical Society approved eye wear brands and reputable vendors, this page by the American Astronomical Society may be helpful. If you don’t have direct viewing glasses, there is hope yet. You can use the pinhole camera. If sunlight comes through a tiny opening, it projects a reverse image. 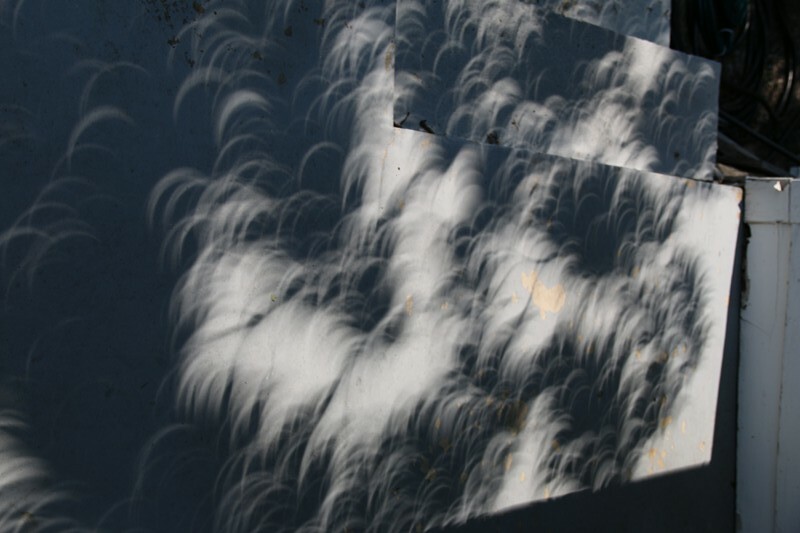 A cardboard box makes a good pinhole camera. All you need is a box with a hole cut in one end, some aluminum foil, tape, and a pin or needle to make a hole in the foil. A piece of white paper or card stock placed in the box opposite from the pinhole is your viewing screen. Here are three excellent videos by former NASA scientist, Dr. Billy Hix, of the Tennessee STEM Innovation Network. He gives great instructions for the safest way to see any sun event in terms non-scientists can understand. In addition to the vision precautions there are still more things to be aware of. Mosquito borne diseases are rampant. Children and the elderly are more at risk than health adults. As it gets darker on Monday, mosquitoes are expected to start coming out. Be prepared with insect repellent. The event will take about three hours from start to finish. Most people will be out in the sun for even longer than that, so good sunblock is important. Traffic is going to be horrendous. Our local Lowe’s sold out an enormous display of eclipse glasses in a half-day. I don’t know how many glasses were in that display, but guessing about a thousand. Multiply that many times over, and realize that many of those people are going to be on the roads. Let’s hope they are not trying to drive and watch the eclipse at the same time. As I told all my kids when teaching them to drive: You are at the mercy of the worst driver in your vicinity, so be prepared for terrible drivers. I have this mental picture of the roads being filled with drivers trying to drive while wearing eclipse glasses or welding masks. Here is a music break. My poet-songwriter friend from New Orleans, Louie Ludwig, has been compared favorably with the likes of Bob Dylan. This is Lucky One, from his album Dark Matters. I had a smile for every one. This entry was posted in Astronomy/Astrophysics, Eye Care and tagged Billy Hix, counterfeit, Eclipse, Here Comes the Sun, Louie Ludwig, NASA, Science. Bookmark the permalink. 9 Responses to Eclipse Day is upon us. Is a dragon going to eat the sun? Wow thank you for this great post. When I was a small child (cannot remember date) my father took my brother and me somewhere to see the eclipse. He was a photographer and he had a darkroom. We used five or six exposed films as filters to look at the eclipse. I don’t know if that was approved or if it was just family lore; my father told us a lot of true scientific things and an unwelcome (later) smattering of nonsense. Even as late as when I was an undergraduate, I knew the old overexposed film trick. Also was told that ordinary gas welding goggles were OK, and you could also smoke a piece of glass over a smoky candle. It is a freaking wonder that I am not blind as a bat. We know a lot more about UV and the effect it has on the eyes now than we did then. As a former astronomy tutor, I advise for maximum safety you should use welding glasses with a 14 or darker tint. Have fun tomorrow Chuck! I love the Richie Havens video! Thanks Raff. Don’t know if you had ever heard of Louie Ludwig before. He is uniquely gifted, but is camera shy, and does not like performing on stage. He does his own video productions too. Heck of a nice guy, and when you are sitting in a barbecue joint booth with him, his girlfriend and a beer, you would never guess you were with a towering talented genius.of both spoken word and song. If he weren’t so stage shy…. He is going to work with me on producing some spoken word videos. Most folks who know me don’t know I can turn off the southern drawl, or use it to effect. After all, Shelby Foote did. I took pictures on the back porch during the peak of the eclipse here. We had approximately 97% totality, being less than 70 miles from the zone of 100% totality. The leaves of a big oak tree acted as a giant camera obscura. Recording thermometers showed the temperature dropped from 87ºF down to 78ºF. The temperature started falling at 1:45 PM. Our peak eclipse occurred at 2:37. The outside temperature started rising again at 3:05 PM.